I read an interesting story earlier in the week by Max Allen in The Australian newspaper. Max is a strong supporter of carignan and thinks it eminently suited for the hot and dry conditions faced in much of Australia. In short, Max’s story is this: Shadowfax winery in Werribee in western Melbourne (towards Geelong) grafted over some existing vines to what was thought to be carignan, which were sourced from century-old carignan vines in the Barossa Valley. There had been some earlier doubts as to whether some of the old Barossa vines identified as carignan were in fact carignan, but instead the little known bonvedro. Shadowfax had sourced its cuttings from the Yalumba Nursery, which had sourced the vines from the Smallfry vineyard in the Barossa Valley and another vineyard. Recent DNA testing has now revealed that these old “carignan” vines from the Barossa are in fact mourvedre and bonvedro. Specifically, Max observes that Shadowfax (and Smallfry)’s carignan is in fact mourvedre. Apparently the vines don’t look or behave much like it, which rather adds to the mystique. Bonvedro as a grape variety is Portugeuse in origin and also appears to be called Cuatendra in north eastern Spain. In a world with many obscure grape varieties, bonvedro would appear truly obscure. It’s not a name I had heard before. Jancis Robinson’s The Oxford Companion to Wine does not even mention it. Jancis’ new tome devoted just to grape varieties, Wine Grapes, I expect will describe it, but as I am yet to fork out for a copy I will need to rely on a reader to add any more colour. Mourvedre is of course much better known, and is also called mataro in Australia. Interestingly, although not discussed in Max’s article but given Shadowfax’s proximity to Geelong, this triggered a memory that I had read somewhere of carignan and mataro being planted in the Geelong region in the nineteenth century. 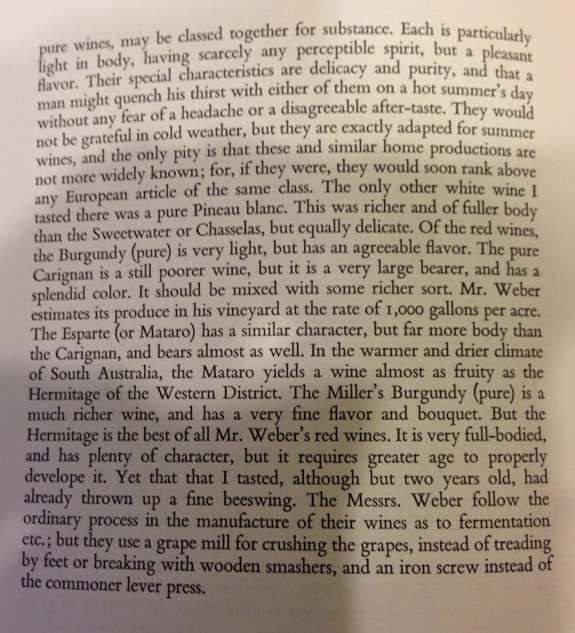 Sure enough, a quick look through Ebenezer Ward’s The Vineyards of Victoria as Visited by Ebenezer Ward in 1864, has various Geelong wineries listed with plantings of mataro, variously called esparte and mataro, and a listing of carignan. Mourvedre generally buds and ripens even later than carignan, and thus requires a very warm climate or site. Though whether those grape varieties are in fact as described is unknowable. That carignan has seemingly been and gone in the region without much remark makes me think that perhaps it’s not so sunbaked down here in southern Victoria. Some might argue that carignan succeeds with the right custodians, but the same could be said for almost any other grape variety – and there are plenty of those. Perhaps people historically just haven’t liked carignan that much. Bonvedro is indeed in Jancis's book Wine Grapes, but it is just a reference to the prime varietal name which is Parraletta. She describes Paraleta thus:Distinctive Somontano variety producing dark aromatic wines in several countries and under many different names.\”In Portugal it is known as Tinta Caiada (red whitewashed? )For an opposing view of the value of Carignan perhaps you should read http://www.carignans.com/carignanrenaissance.htmI vaguely remember that Jancis mellowed somewhat on views about carignan. Also in the New book carignan is listed under Mazuella. DNA profiling is rolling up some of these varieties that we once imagined were distinct. I came across 7 bottles of straight Carignan by Mt Prior in Rutherglen, with about 7 or 8 years bottle age, some years back at a bottle shop in Glen Waverly VIC. Purchased one, loved it, had thrown a huge crust and was not unlike a big pinot. Bought the other 6 and when finished tried to get more only to find that they had pulled the vines out! Interesting comment. I think carignan would likely work quite well in Rutherglen too! Pity.